The Green Valley Campground is a nice quiet camp with shade trees, nestled near the Yellowstone River. We have fishing on premises. No license needed. Trout have been caught up to 14 inches. We have large motel like showers with plenty of hot-soft-water. We have a large full sized pool table, pin ball machines, horseshoes, playground and volleyball and basketball court. Easy access off Exit 213 on I-94. Laundry and playground. 20, 30, or 50 amp service. Public phone on the premises, and mail and newspaper service. We are AAA rated and have a capacity of 60 sites. Also room for large rigs. 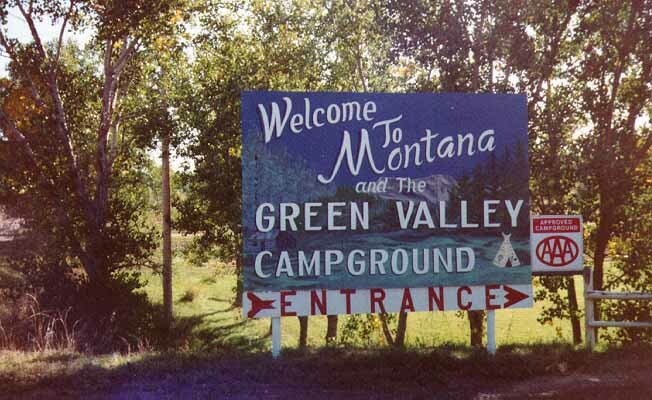 Green Valley Campground is located in Glendive, Montana. Take exit 213 off of I-94, then go 1/2 mile north on Highway 16, then 1/8 mile east (right turn) on Green Valley Lane.Green Valley Campground is located in Glendive, Montana. Take exit 213 off of I-94, then go 1/2 mile north on Highway 16, then 1/8 mile east (right turn) on Green Valley Lane.